The Home of Moonstone Beach! 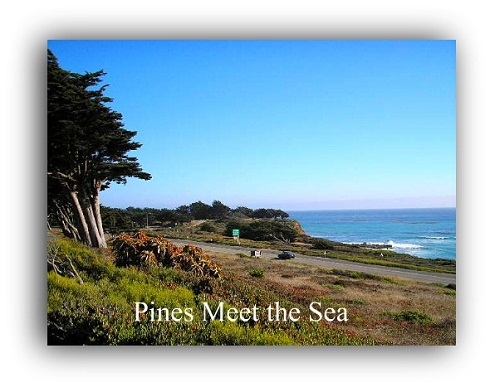 When I first arrived in Cambria from Mississippi, in August of 2005, I couldn't believe a place like this existed ! My first walk on Moonstone beach was unforgettable. It was cold and the distinct smell of sea salt sent a charge of excitement into my soul. I was home. After years of heat, humidity and hurricanes I was home. I had never been here before but I knew I was finally home. For years I dreamed of a place like this but now I was finally where I belonged. The sound of the waves brushing and bursting against the rocks made me think of Blue Whales and great White Sharks. The pines brought memories of the Smokey Mountains but now I had an ocean with big waves to enjoy. The short pants I was wearing would have to be replaced with long pants. It was cold. It didn't take me long to realize coats, sweaters and sock hats are the proper attire for Moonstone Beach. 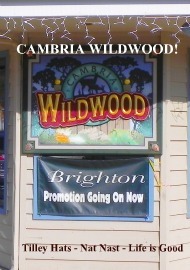 If you forget your sweater or need a warm hat you can go to Cambria Wildwood the "outfitters for the good life". This little store is owned by friends of mine. I promise, you will find some nice, warm clothes to fit your adventure. The wonderful part about living on the central coast is the adventure never stops. I don't have to go anywhere for a vacation. I live in a vacation. There are countless things to do and see in my town. 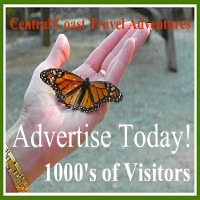 Central Coast Travel Adventures will outline our vacation wonderland and all the splendid things my wife and I do on the central coast. We want you to use our adventures to plan your next day trip or vacation to our home town. The Hearst Ranch is a few miles away and I love to watch the Zebra run wild. The truth is you only see them from time to time. They don't just magically appear for tourist to take pictures. The Zebra have a mind of their own. 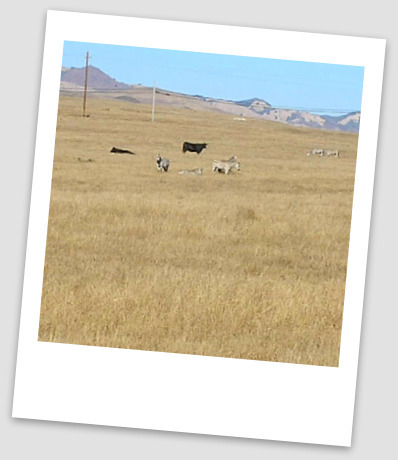 Going towards San Simeon Cove you can see the Zebra mixing with the cattle. Warning, be extremely cautious driving by when the Zebra's are out. People are startled at the sight and slam on brakes or stop suddenly when they see the Zebra. I remember thinking, what else is out there, maybe a few tigers and lions. Who knows what Mr. Hearst put on his ranch. Not to far from the Zebra, the Elephant Seals come to give birth. I remember the first time I went to see the seals. The males were fighting and they sounded like monsters and looked like creatures from another world. I guess they are from another world, the world of the sea. Three Important things To Know! DO - Hearst Castle is the number one attraction and the Elephant Seals come in a close second. Take a walk on Moonstone Beach and feel the cool breeze refresh your spirit. You have to see Nitwit Ridge and then grab a cup of fresh coffee at one of the many coffee shops. Shopping is a unique experience in both villages so don't forget to make time to look in our shops and galleries. While you're shopping, make sure to stop into best hat store this side of the Rocky Mountains, Wildwood, and say hello to Mary my wife. Don't forget our state parks. In the near future I will tell you were to find the state parks and and the features of each park. The local chamber of commerce has provided a neat little map to help you find everything in our area, including all the trails and state parks. All you have to do is Click Here. The chamber will be glad to assist if you need help once you arrive in town. The chamber is located in the west village right next to The Coffee Den. Be sure to stop in and say hello and tell them Bob Sent you. 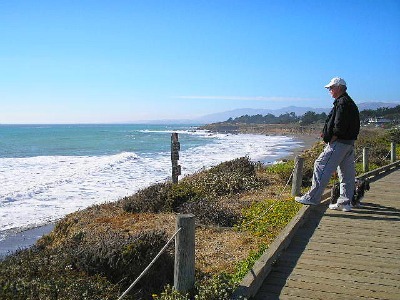 For detailed information on things to do in Cambria. California click on the links below. 13. Nit Wit Ridge CLICK HERE. 14. A Trip to the Beach CLICK HERE. 15. Christmas in Cambria CLICK HERE. 16. Cambria Business Center CLICK HERE. 19. Cambria Boardwalk Hikes Click Here. 20. Tin City Businesses Click Here. The Red Moose Cookie Company Homemade Gourmet Cookies, Fudge Brownies Their Specialty "Naughty Rods" Curious? 2531 Village Lane Cambria, CA. Click on the Image to get directions. STAY - Do you want to stay in a motel on Moonstone? We have a wide selection of motels and Bed & Breakfast. You might be interested in camping in one of the state parks. Don't worry we have plenty of places to stay. Vacation rentals are also available. Most of the time our hotels and motels stay book. Make sure you book in advance. 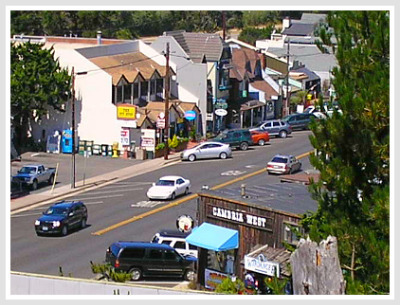 We will make direct recommendations on where to eat in Cambria. Every restaurant we list are places we have dined. If we are not totally satisfied with the service and the food we will not list them on this site. We want you to have the best dining experience on your visit to our home town. Take a look at the list below and click on the link for more information. 1. Old Stone Station Click Here. 2. Creekside Gardens Cafe Click Here. 3. French Corner Bakery Click Here.